The Most Rev. 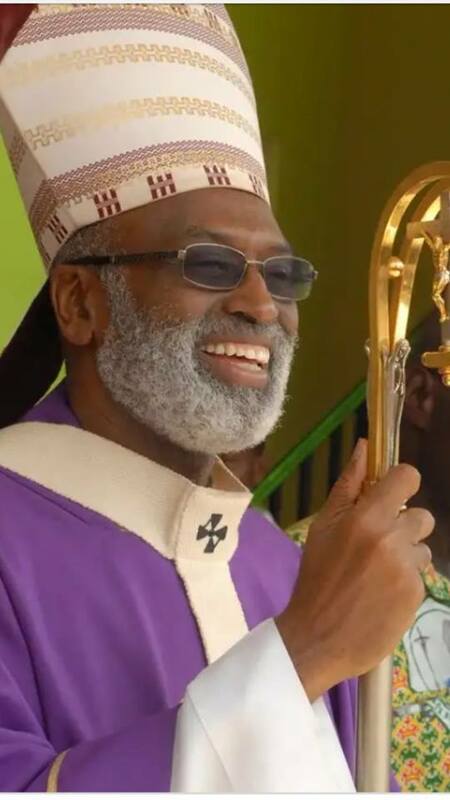 Charles G. PALMER-BUCKLE actual Bishop of the Catholic Archdiocese of Cape Coast was born on June 15, 1950 at Axim in the Western Region of Ghana. He has 6 brothers and 5 sisters. He entered Pope John XXIII Secondary School and Minor Seminary, Effiduase, Koforidua at the age of 13 and upon completion of secondary education,he was sent in 1971 by the then Bishop of Accra, Most Rev. Joseph Oliver BOWERS, SVD., DD., JCL., to the Pontifical Urban College and University, Rome, Italy.He completed the seminary training with a Bachelor’s degree in Philosophy and another in Sacred Theology. On his return home to Ghana, he was ordained to the Holy Priesthood on December 12, 1976 by Most Rev. Dominic K. ANDOH, DD., JCD., then Bishop of Accra at the Holy Spirit Cathedral, Accra, Ghana. After three years of priestly ministry as Diocesan Youth Chaplain and Vocation’s Director as well as Teacher and Student’s Chaplain of his alma mater, Pope John XXIII Secondary and Minor Seminary, Father Palmer-Buckle went back for post-graduate studies at the Pontifical Salesian University, Rome, Italy. In 1984, he returned home with a Doctorate Degree in Sacred Theology and was appointed Teacher and Chaplain of St. Thomas Aquinas Secondary School in Accra and Diocesan Laity Chaplain. In 1985 he was transferred to Achimota Secondary School as Catholic Chaplain and Teacher, where he remained till 1992. During the period (1985-1992), he was Acting Editor of the National Catholic Weekly, “The Standard”, Priest in-charge of St. Thomas More Catholic Church, Achimota and President of the National Union of Catholic Diocesan Priests’ Associations (NUGDPA). In November 1992, Fr. Palmer-Buckle was nominated first Bishop of the newly created Catholic Diocese of Koforidua, carved out of the Catholic Archdiocese of Accra, and on January 6, 1993, he was ordained to the Episcopacy in the St. Peter’s Basilica, in the Vatican City, Italy by His Holiness, Pope John Paul II of blessed memory. From 1994 to 2004, the Most Reverend Palmer-Buckle was the Bishop-Chairman for the Department of Socio-Economic Development of the Catholic Bishop’s Conference, and from 1995 to 2003 he was for two terms President of Caritas Africa Region and First Vice President of Caritas International, a federation of 198 member-organisations in 154 countries all over the world with headquarters in the Vatican City. In May 2002, he was appointed one of the 9-member National Reconciliation Commission (NRC) of Ghana by His Excellency John Agyekum KUFOUR, President of the Republic of Ghana, to help bring reconciliation and healing of the past to fellow Ghanaians. He served on this commission till October 2004, when it concluded the assignment and submitted the report. In November 2004, Bishop Palmer-Buckle was elected Vice President of Ghana Catholic Bishops’ Conference, and made the Bishop-Chairman of the Justice and Peace Commission of the Conference. On March 30, 2005, he was appointed Metropolitan Archbishop of Accra by His Holiness John Paul II of blessed memory. Currently He have been elected to be the Archbishop of Cape Coast on May 11, 2018, by His Holiness Pope Francis.